Infections caused by resistant microorganisms often fail to respond to conventional treatment, resulting in prolonged illness and greater risk of death. About 440 000 new cases of multidrug-resistant tuberculosis (MDR-TB) emerge annually, causing at least 150 000 deaths. Resistance to earlier generation antimalarial medicines such as chloroquine and sulfadoxine-pyrimethamine is widespread in most malaria-endemic countries. Inappropriate and irrational use of antimicrobial medicines provides favourable conditions for resistant microorganisms to emerge, spread and persist. Antimicrobial resistance (AMR) is resistance of a microorganism to an antimicrobial medicine to which it was previously sensitive. Resistant organisms (they include bacteria, viruses and some parasites) are able to withstand attack by antimicrobial medicines, such as antibiotics, antivirals, and antimalarials, so that standard treatments become ineffective and infections persist and may spread to others. AMR is a consequence of the use, particularly the misuse, of antimicrobial medicines and develops when a microorganism mutates or acquires a resistance gene. Infections caused by resistant microorganisms often fail to respond to the standard treatment, resulting in prolonged illness and greater risk of death. AMR reduces the effectiveness of treatment because patients remain infectious for longer, thus potentially spreading resistant microorganisms to others. Many infectious diseases risk becoming uncontrollable and could derail the progress made towards reaching the targets of the health-related United Nations Millennium Development Goals set for 2015. When infections become resistant to first-line medicines, more expensive therapies must be used. The longer duration of illness and treatment, often in hospitals, increases health-care costs and the financial burden to families and societies. The achievements of modern medicine are put at risk by AMR. Without effective antimicrobials for care and prevention of infections, the success of treatments such as organ transplantation, cancer chemotherapy and major surgery would be compromised. The growth of global trade and travel allows resistant microorganisms to be spread rapidly to distant countries and continents. About 440 000 new cases of multidrug-resistant tuberculosis (MDR-TB) emerge annually, causing at least 150 000 deaths. Extensively drug-resistant tuberculosis (XDR-TB) has been reported in 64 countries to date. Resistance to earlier generation antimalarial medicines such as chloroquine and sulfadoxine-pyrimethamine is widespread in most malaria-endemic countries. Falciparum malaria parasites resistant to artemisinins are emerging in South-East Asia; infections show delayed clearance after the start of treatment (indicating resistance). A high percentage of hospital-acquired infections are caused by highly resistant bacteria such as methicillin-resistant Staphylococcus aureus (MRSA) and vancomycin-resistant enterococci. AMR has become a serious problem for treatment of gonorrhoea (caused by Neisseria gonorrhoeae), involving even "last-line" oral cephalosporins, and is increasing in prevalence worldwide. Untreatable gonococcal infections would result in increased rates of illness and death, thus reversing the gains made in the control of this sexually transmitted infection. New resistance mechanisms, such as the beta-lactamase NDM-1, have emerged among several gram-negative bacilli. This can render powerful antibiotics, which are often the last defence against multi-resistant strains of bacteria, ineffective. Inappropriate and irrational use of medicines provides favourable conditions for resistant microorganisms to emerge and spread. For example, when patients do not take the full course of a prescribed antimicrobial or when poor quality antimicrobials are used, resistant microorganisms can emerge and spread. depleted arsenals of diagnostics, medicines and vaccines as well as insufficient research and development on new products. The emergence of AMR is a complex problem driven by many interconnected factors; single, isolated interventions have little impact. A global and national multi-sectoral response is urgently needed to combat the growing threat of AMR. WHO has selected combating antimicrobial resistance as the theme for World Health Day 2011. On this day, WHO issues an international call for concerted action to halt the spread of antimicrobial resistance and recommends a six-point policy package for governments. WHO calls on all key stakeholders, including policy-makers and planners, the public and patients, practitioners and prescribers, pharmacists and dispensers, and the pharmaceutical industry, to act and take responsibility for combating antimicrobial resistance. May 23, 2013 Angelina Jolie's public announcement of her decision to undergo a double prophylactic mastectomy after learning she was positive for a mutation in the BRCA1 gene has certainly put genetic testing squarely into the limelight. However, her story has also caused a ripple of backlash across the Internet, exposing the realities of many US women who have little choice on the issue, especially if they do not have the health insurance, the money, or the means to undertake a series of extended medical procedures. Several posts have expressed sadness, anger, and resentment over the media storm surrounding Jolie. Although people appreciate the difficulty of making such a decision and the courage of going so public with it, they also bring attention to the other side of the story. "The bigger issue is that many women in America simply cannot afford to be sick," says one blogger, writing in Salon.com. "The issue of affordability has been swept under the carpet. The media has instantly polarized the debate in terms of women who may or may not entreat medical intervention. " In a commentary published in the LA Times, writer Robin Abcarian notes, "Unlike Jolie, most people do not live in a world where cost, even to save one's life, is no object." She commends Jolie for sharing her story, adding, "It would be a lovely thing if everyone had access to the high level of care she has received." Some of the articles took a stronger and more acrid tone. A teacher in New Jersey, also with a strong family history of cancer, reported that Jolie's account "upset me." "That's good for her; she's got the best health care and she's got money. She doesn't have to worry about taking off of work. She doesn't have to worry about taking care of her family, cooking or cleaning — the things that the normal woman would have to do," she wrote. Disparities in access to healthcare is not a new revelation — it is an issue that has been at the political forefront in the United States — and with no real solutions at hand, Jolie's story has served to amplify that rift. There are an estimated 940,000 BRCA mutation–carriers living in the United States, but only about 10% are aware of their status, commented Lisa Schlager, vice president, Community Affairs and Public Policy at FORCE, a national nonprofit organization focused on hereditary breast and ovarian cancer. "While there are multiple factors involved, many of the women simply can't afford to find out," she told Medscape Medical News. "That is unfortunate, as this is the direction where medicine is going," she commented in an interview. "We have the ability to use this information to customize and personalize care, and we are hindering this progress." We have the ability to use this information to customize and personalize care, and we are hindering this progress. Schlager believes that the huge publicity surrounding Jolie's story has helped bring genetic testing to the forefront, along with all of the gaps and inconsistencies. But there is also the danger that Jolie's story might tend to simplify how extensive the entire process of undergoing a prophylactic mastectomy actually is. "We need to explain that this is not an easy surgery," she said. "This is not the same as getting a breast enhancement. Things can go wrong, there can be significant complications, and recovery can take a while." It is also not a 1-step deal to remove and reconstruct the breast, and in fact, multiple surgeries may be needed during reconstruction, to reach the desired effect. "We don't want to scare women away, we just want them to go into it with their eyes open," she said. Jolie is not the first celebrity who has spoken openly about opting for double mastectomies. Actress Christina Applegate was diagnosed with breast cancer at age 36, and after finding out that she was positive for the BRCA gene mutation, opted for a bilateral mastectomy. But she already had a cancer diagnosis, whereas Jolie's surgery was prophylactic. The dilemma of whether or not to undergo the procedure is illustrated by a story from the United Kingdom in which a popular television presenter, Kristie Allstrop, has talked about her family history of breast cancer and her decision to opt for monitoring (for now), whereas her sister Fiona decided to undergo a double prophylactic mastectomy. Although Fiona had tested negative for the BRCA1 and BRCA2 genes, medical experts believed that, given the family's medical history, she probably carried a yet unidentified mutant gene, according to press reports. The whole process of counseling, genetic testing, and any preventive actions taken as a result of testing is expensive. For a start, the cost of the BRCA test alone is about $4000. Preventive surgery and more frequent screenings can be prohibitively expensive, even if a woman does have insurance. Especially with surgery, indirect costs, such as those associated with taking time off from work and childcare, also need to be figured into the equation. But there is an upside to the story. Although genetic counseling, testing, and preventive options will continue to remain out of reach for many women in the foreseeable future, there are options, and the tide may slowly be shifting. Many insurers will cover the cost of prophylactic mastectomies, according to Jen Flory, JD, "although it often takes filing both an internal and external appeal to get it." "The BRCA testing itself should be covered by any plan started after March 23, 2010, as Health and Human Services has found this to be one of the mandatory free preventative care measures covered under the Affordable Care Act [ACA]," said Flory, who is director of the Cancer Legal Resource Center, Los Angeles, California. "Older insurance companies generally charge a co-pay or coinsurance for the test." Schlager noted that in her experience, most major insurers will cover genetic counseling and testing, provided that the patient meets the guidelines set by the National Comprehensive Cancer Network (NCCN). "The guidelines are very specific...as far as personal history or family history. So if you don't meet them, you probably won't be covered," she added. When it goes into full effect, the ACA will at minimum provide genetic counseling to certain persons and their families, she added, although there are some caveats. "Men do not qualify for BRCA testing under the ACA," Schlager said. "And Medicare will only cover it if you already have cancer." The rationale for that, believes Schlager, is that genetic cancers tend to strike at a younger age, and Medicare is dealing with an older population. "But still, it would be good to be identified as a carrier, as that would be important information for the family," she said. Medicaid coverage is also restrictive, and coverage of the test varies state by state, according to Flory. "Those that cover it generally have stringent risk factors and cover it on a once-in-a-lifetime basis." Myriad Genetics, currently the only company offering testing for the BRCA gene, also offers free testing for low-income women and those without any insurance. They have very stringent eligibility criteria, Schlager pointed out, but it still is an option, and many women can get tested that way. As previously reported by Medscape Medical News, Myriad has been enmeshed for several years in a legal battle over its patent rights to the BRCA genes, and the case is currently being deliberated by the US Supreme Court. Oral arguments were heard on April 15, and a decision is expected this summer. But once a woman has received genetic counseling and opted for testing — then what? Information is a scary thing if you can't do anything with it," said Schlager. And for some women, that is where they will reach an impasse. Information is a scary thing if you can't do anything with it. Many insurance companies will pay for preventive services, provided they meet certain criteria, such as those outlined by the NCCN. If an insurance company covers a mastectomy, whether prophylactic or for cancer treatment, it is obligated to cover the costs of the reconstructive surgery, owing to regulations in the Women's Health and Cancer Rights Act (WHCRA), which was signed into law in 1998. But unlike Jolie, women may be limited in their choice of plastic surgeons, depending on their insurance coverage. They may only be able to use surgeons within their insurer's network, for example, and some plastic surgeons do not take insurance at all. It can also be difficult to find a surgeon willing to take Medicaid, owing to the very low reimbursement. In addition, health insurance will generally not cover everything. There could be co-payments and incidentals that can bring out-of-pocket expenses into the 5-figure realm. Schlager, who underwent prophylactic mastectomy herself in the late 1990s, notes that even though she was covered under a good insurance policy, over the years she has incurred about $20,000 in out-of-pocket expenses. The cost of a prophylactic mastectomy, with reconstruction, can run upwards of $100,000 when the fees from the hospital, anesthesia, surgeons, medications, and incidentals are factored in. Add in possible complications, such as an infection, and the cost can easily double. On Breastcancer.org, where women in the forum have compared notes, they report having to pay between $10,000 and $25,000 in co-payments or fees that their insurance company will not pick up. One noted that her insurer only paid $6,500 of the $28,000 it cost for reconstruction, while another reported $40,000 in out-of-pocket costs because of her 20% co-pay. Even surveillance can be costly. Mammograms are usually covered, and there are often low-cost options for those, commented Heather MacDonald, MD, assistant professor of clinical obstetrics and gynecology and breast surgery at the University of Southern California (USC), in Los Angeles. "But MRIs [magnetic resonance images], which are also recommended, are very expensive, and it can be difficult getting insurers to pay for them." For women without insurance, options become even slimmer, and most would be unable to afford surgery. Although not the only option, even surveillance and chemoprevention can be beyond the means of many. Dr. MacDonald, however, is optimistic that with perseverance and ingenuity, many more people can have access to healthcare. With her colleagues, she runs a high-risk clinic at USC, where they offer a wide range of preventive options, including mammograms, MRIs, pelvic ultrasounds, medications, and surgical prophylaxis "if that's what patients choose." "There is a hodgepodge of programs that we can get patients enrolled in," Dr. MacDonald said in an interview. "We get creative, and it is rare that we don't have something that we can offer high-risk women." She explained that they have a 3-year grant from the Avon Foundation and that the Medicaid program in California (known as MediCal) will pay for BRCA testing for eligible patients. "So as the Affordable Care Act expands MediCal, we will be able to get more patients covered." "So this is very much going to be a state-by-state issue as to how patients are covered under the Affordable Care Act," she added. "We are lucky in California that MediCal will cover BRCA testing for patients who really need it." The MediCal model is set up so that women see a genetic counselor, but many patients cannot afford or lack access to one. In such cases, there are guidelines that are published by the American Congress of Obstetricians and Gynecologists (ACOG) and the NCCN that give very clear criteria as to who may benefit from testing, Dr. MacDonald explained. "If those patients have a primary care doctor and fall within the guidelines for testing, then their primary care doctor can order the test for them." Dr. MacDonald emphasized that it is far better to involve a genetic counselor because it is a complicated process, but if that option is not available, then a physician can coordinate it. "MedicCal will cover, based on the NCCN guidelines," she noted. She is optimistic that women in other parts of the country can also receive assistance. "It can be done," she said. "It required dedicated personal and outside money, and Avon was the fifth organization that we submitted our proposal to before someone gave us a chance. Anyone in LA County is eligible to join our program." Dr. MacDonald points out that the women who are most likely to struggle are those in small rural areas, where access to care may already be problematic. It may be harder to find a physician who accepts Medicaid, because providers in these areas can be few and far between. It is also more difficult to access large academic medical centers, which often provide services at low cost or free of charge. "Finding providers to take Medicaid is a problem and will continue to be, but it will hopefully get better," she noted, adding that under the ACA, more women may be able to obtain health insurance, which will open the door to more options. Cite this article: Roxanne Nelson. BRCA Choices Not Affordable for Many US Women. Medscape. May 23, 2013. May 16, 2013 Superstar Angelina Jolie's headline revelation this week about her positive genetic test for the BRCA1 mutation and subsequent double prophylactic mastectomy has stunned the world and put the entire field of breast cancer medicine on high alert. Her story is "the epitome" of individualized medicine, said Eric Topol, MD, editor-in-chief of Medscape. "She took charge by getting the test done, getting the critical information about whether she would be at risk for breast cancer and how high that risk would be, and then making a key decision of preventive surgery," said Dr. Topol, who is director, Scripps Translational Science Institute Chief Academic Officer, Scripps Health Professor of Genomics, the Scripps Research Institute. With more than 1600 comments registered for Jolie's New York Times op-ed piece, there is little doubt about the intense public interest, which is already having a ripple effect in cancer clinics across the United States. "With this publicity and her speaking out, I have a feeling there will be increased requests [for BRCA testing]," Sandra M. Swain, MD, president of the American Society of Clinical Oncology, told Medscape Medical News. "We already know from studies that women think they are at a higher risk of breast cancer than they actually are," said Dr. Swain, a breast cancer specialist and medical director of the Washington Cancer Institute at MedStar Washington Hospital Center. "Hearing this, people may think, 'Oh, she's 37, maybe I also have that risk.' "
Indeed, there has already been an uptick in patient calls and emails at Moores Cancer Center at the University of California, San Diego. "People are just wondering about how to go about getting the test or more information," said Lisa Madlensky, PhD, CGC, a cancer geneticist and director of the center's Family Cancer Genetics Program, in an interview. "I expect a lot of women are asking themselves if they should get tested or not because of a family history," said Jennifer Litton, MD, from the Department of Breast Medical Oncology, Division of Cancer Medicine, the University of Texas MD Anderson Cancer Center, in Houston. "Overall, I think healthcare providers may expect increased questions about this testing," she told Medscape Medical News. Unlike the average woman, who faces a breast cancer risk of about 12%, Jolie's risk before surgery was roughly 7-fold higher. "My doctors estimated that I had an 87 percent risk of breast cancer and a 50 percent risk of ovarian cancer," wrote Jolie, whose mother was diagnosed with ovarian cancer at 46 years of age and died a decade later. But physicians fielding questions and requests for BRCA testing from patients on the basis of a worrying family history "really need to be armed with information," said Dr. Swain. "Primary care is going to be responsible for a lot of this, and so they're the ones who really need to be educated about what to do and not just be ordering this test on everybody. It's an expensive test, there are a lot of implications. I personally don't order the test — and I know a lot about it — so a primary care physician who really has no education in it should really not be ordering this test. I have a genetic counselor who does a full pedigree to see if they're at increased risk and need to be tested for a BRCA mutation". "It's not something you want to automatically order," agreed Dr. Madlensky, who says that ideally, patients should be screened in primary care for red flags that might suggest the need for referral to genetic counseling — even before a test is considered. "There are different types of BRCA testing, and knowing which one to order is a bit complicated, depending on ancestry, cancer diagnosis or not, known BRCA mutation in family or not," she said, adding that a patient's family history should not be taken at face value. "A lot of times, the story that is in the family is not accurate. Breast cancer reporting is pretty good, but when people report they had a relative with ovarian cancer, often when we try to get those records, we find it was not ovarian but cervical or uterine or something not related to the BRCA genes." Although Jolie has not publicly discussed the full extent of her family history beyond her mother, sources suggest that other relatives have likely been either diagnosed with similar cancers or have tested positive for the BRCA mutation. But even if a person's history involves only 1 first-degree relative, BRCA testing "could be" appropriate in some cases, especially if that relative can no longer be tested herself, said Dr. Madlensky. BRCA testing should be viewed as a family undertaking, preferably with the cancer patient central, she added. "We really ideally want the first test in the family to be on someone who's had a cancer diagnosis. That way, we can figure out whether cancer was result of a BRCA mutation or not. If that test is negative, then there's no need to go and test any of the other family members," she explained. "That's something most people — including physicians — are not aware of," she added. Sometimes, discussing why a patient should not pursue testing can also be very helpful, commented Jennifer Litton, MD, assistant professor of breast medical oncology, the University of Texas MD Anderson Cancer Center. "It is important for everyone to realize and to communicate when discussing with patients that a mutation in the BRCA gene only accounts for 5% to 10% of breast cancer, and so for the vast majority of women who get breast cancer, it is not due to a mutation in this gene," she said. Prophylactic double mastectomy is a choice that often sparks debate, sometimes shock and disbelief, and always emotion. "Once I knew that this was my reality, I decided to be proactive and to minimize the risk as much I could," wrote Jolie. "I started with the breasts, as my risk of breast cancer is higher than my risk of ovarian cancer." Speaking to the New York Times, breast surgeon Susan Love, MD, said, "When you have to cut off normal body parts to prevent a disease, that's really pretty barbaric when you think about it." But Jolie's decision was "a very, very solid choice, a reasonable choice, especially in the face of such alarming high risk of breast cancer and ovarian cancer," said Dr. Swain. Dr. Madlensky agreed. "For someone who tests positive for BRCA mutation, its actually not radical at all. Its one of the options that is medically appropriate." Other options for women with this mutation are medication (tamoxifen or raloxifene) or screening, "but we know screening is not preventative. It only hopes to find a cancer as early as possible," said Dr. Litton. For Jolie, the surgery eliminated fear. "My chances of developing breast cancer have dropped from 87 percent to under 5 percent. I can tell my children that they don't need to fear they will lose me to breast cancer," she wrote. "The decision to have a mastectomy was not easy. But it is one I am very happy that I made.... I do not feel any less of a woman. I feel empowered that I made a strong choice that in no way diminishes my femininity." Much of the work physicians may face in light of Jolie's story will involve providing information and alleviating the kind of anxiety Jolie described — time-consuming tasks, especially because many women tend to overestimate their risk, said Mary Jane Esplen, RN, PhD, head, Program of Psychosocial and Psychotherapy Research in Cancer Genetics at Toronto General Research Institute, in Canada. Dr. Esplen has found psychosocial oncology counseling helpful for women who cannot always accept the facts when they are told that their risk is low. "Risk perceptions are not always based on what we might refer to as rational knowledge," she said. "We saw that just giving information alone wasn't modifying their own internal sense of risk. It had to do with family history, sometimes there were losses in families and it had to do with grief, and it had to do with this imprint that's left with a family history and the experiences associated with that." Referring patients to genetic counseling can also be effective in diffusing anxiety, said Dr. Madlensky, debunking the notion that such counselors are hard to find. "One of the biggest myths is that its hard to get access to a cancer genetic specialist," she said, but that is not the case. The National Society of Genetic Counselors 2012 professional status survey found that wait times for the vast majority of its members were within a 2-week period, she noted. Cite this article: Angelina Jolie's Mastectomy: BRCA Testing in the Spotlight. Medscape. May 16, 2013. Pacemakers can be temporary or permanent. Temporary pacemakers are used to treat short-term heart problems, such as a slow heartbeat that's caused by aheart attack, heart surgery, or an overdose of medicine. Bradycardia is a slower than normal heart rate. The heart usually beats between 60 and 100 times a minute in an adult at rest. If you have bradycardia (brad-e-KAHR-de-uh), your heart beats fewer than 60 times minute. Multiple sclerosis (MS), also known as "disseminated sclerosis" or "encephalomyelitis disseminata", is an inflammatory disease in which the fattymyelin sheaths around the axons of the brain and spinal cord are damaged, leading to demyelination and scarring as well as a broad spectrum ofsigns and symptoms. Disease onset usually occurs in young adults, and it is more common in women. It has a prevalence that ranges between 2 and 150 per 100,000. MS was first described in 1868 by Jean-Martin Charcot. MS affects the ability of nerve cells in the brain and spinal cord to communicate with each other effectively. Nerve cells communicate by sending electrical signals called action potentials down long fibers called axons, which are contained within an insulating substance called myelin. In MS, the body's own immune system attacks and damages the myelin. When myelin is lost, the axons can no longer effectively conduct signals. The namemultiple sclerosis refers to scars (sclerae-—better known as plaques or lesions) particularly in the white matter of the brain and spinal cord, which is mainly composed of myelin. Although much is known about the mechanisms involved in the disease process, the cause remains unknown. Theories include genetics or infections. Different environmental risk factors have also been found. Almost any neurological symptom can appear with the disease, and the disease often progresses to physical and cognitive disability. Psychiatric symptoms and difficult thinking may also occur. MS takes several forms, with new symptoms occurring either in discrete attacks (relapsing forms) or accumulating over time (progressive forms). Between attacks, symptoms may go away completely, but permanent neurological deficits often occur, especially as the disease advances. A person with MS can suffer almost any neurological symptom or sign, including changes in sensation such as loss of sensitivity or tingling, pricking or numbness (hypoesthesia and paresthesia), muscle weakness, clonus, muscle spasms, or difficulty in moving; difficulties with coordination and balance (ataxia); problems in speech (dysarthria) or swallowing (dysphagia), visual problems (nystagmus, optic neuritis including phosphenes, or diplopia),fatigue, acute or chronic pain, and bladder and bowel difficulties. Cognitive impairment of varying degrees and emotional symptoms of depression orunstable mood are also common. Uhthoff's phenomenon, an exacerbation of extant symptoms due to an exposure to higher than usual ambient temperatures, and Lhermitte's sign, an electrical sensation that runs down the back when bending the neck, are particularly characteristic of MS although not specific. The main clinical measure of disability progression and symptom severity is the Expanded Disability Status Scale or EDSS. The risk of acquiring MS is higher in relatives of a person with the disease than in the general population, especially in the case of siblings, parents, and children. The disease has an overall familial recurrence rate of 20%. In the case of monozygotic twins, concordance occurs only in about 35% of cases, while it goes down to around 5% in the case of siblings and even lower in half-siblings. This indicates susceptibility is partly polygenicallydriven. It seems to be more common in some ethnic groups than others. Apart from familial studies, specific genes have been linked with MS. Differences in the human leukocyte antigen (HLA) system—a group of genes inchromosome 6 that serves as the major histocompatibility complex (MHC) in humans—increase the probability of suffering MS. That changes in the HLA region are related to the susceptibility of an individual for MS has been known for over thirty years, and additionally this same region has been implicated in the development of other autoinmmune diseases such as diabetes type I and systemic lupus erythematosus. The most consistent finding is the association between multiple sclerosis and alleles of the MHC defined as DR15 and DQ6. 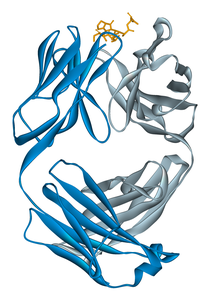 Other loci have shown a protective effect, such as HLA-C554 and HLA-DRB1*11. Overall, it has been stimated that HLA changes accounts for between 20 and 60% of the genetic predisposition for MS. Modern genetic methods (Genome-wide association studies, or GWAS) have also permitted to discover at least 12 other genes outside the HLA locus that modestly increase the probability of suffering MS. Severe stress may be a risk factor although evidence is weak. Smoking has also been shown to be an independent risk factor for developing MS.Association with occupational exposures and toxins—mainly solvents—has been evaluated, but no clear conclusions have been reached.Vaccinations were investigated as causal factors for the disease; however, most studies show no association between MS and vaccines. Several other possible risk factors, such as diet and hormone intake, have been investigated; however, evidence on their relation with the disease is "sparse and unpersuasive". 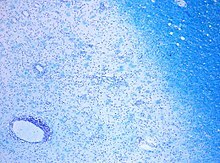 Evidence for viruses as a cause includes the presence of oligoclonal bands in the brain and cerebrospinal fluid of most people with MS, the association of several viruses with human demyelinationencephalomyelitis, and induction of demyelination in animals through viral infection. Human herpes viruses are a candidate group of viruses linked to MS. Individuals who have never been infected by the Epstein-Barr virus have a reduced risk of having the disease, and those infected as young adults have a greater risk than those who had it at a younger age. Although some consider that this goes against the hygiene hypothesis, since the noninfected have probably experienced a more hygienic upbringing, others believe that there is no contradiction since it is a first encounter at a later moment with the causative virus that is the trigger for the disease. Other diseases that have also been related with MS are measles, mumps, and rubella. The name multiple sclerosis refers to the scars (sclerae – better known as plaques or lesions) that form in the nervous system. MS lesions most commonly involve white matter areas close to theventricles of the cerebellum, brain stem, basal ganglia and spinal cord; and the optic nerve. The function of white matter cells is to carry signals between grey matter areas, where the processing is done, and the rest of the body. The peripheral nervous system is rarely involved. More specifically, MS destroys oligodendrocytes, the cells responsible for creating and maintaining a fatty layer—known as the myelin sheath—which helps the neurons carry electrical signals(action potentials). MS results in a thinning or complete loss of myelin and, as the disease advances, the cutting (transection) of the neuron's axons. When the myelin is lost, a neuron can no longer effectively conduct electrical signals. A repair process, called remyelination, takes place in early phases of the disease, but the oligodendrocytes cannot completely rebuild the cell's myelin sheath. Repeated attacks lead to successively fewer effective remyelinations, until a scar-like plaque is built up around the damaged axons. Different lesion patterns have been described. The T cells recognize myelin as foreign and attack it as if it were an invading virus. This triggers inflammatory processes, stimulating other immune cells and soluble factors like cytokines andantibodies. Further leaks form in the blood–brain barrier, which in turn cause a number of other damaging effects such as swelling, activation of macrophages, and more activation of cytokines and other destructive proteins. Clinical data alone may be sufficient for a diagnosis of MS if an individual has suffered separate episodes of neurologic symptoms characteristic of MS. Since some people seek medical attention after only one attack, other testing may hasten and ease the diagnosis. The most commonly used diagnostic tools are neuroimaging, analysis of cerebrospinal fluid and evoked potentials. Magnetic resonance imaging of the brain and spine shows areas of demyelination (lesions or plaques). Gadolinium can be administered intravenously as a contrast to highlight active plaques and, by elimination, demonstrate the existence of historical lesions not associated with symptoms at the moment of the evaluation. Testing of cerebrospinal fluid obtained from alumbar puncture can provide evidence of chronic inflammation of the central nervous system. The cerebrospinal fluid is tested for oligoclonal bands of IgG on electrophoresis, which are inflammation markers found in 75–85% of people with MS. The nervous system of a person with MS responds less actively to stimulation of the optic nerve and sensory nerves due to demyelination of such pathways. These brain responses can be examined using visual and sensory evoked potentials. The relapsing-remitting subtype is characterized by unpredictable relapses followed by periods of months to years of relative quiet (remission) with no new signs of disease activity. Deficits suffered during attacks may either resolve or leave sequelae, the latter being more common as a function of time. This describes the initial course of 80% of individuals with MS. When deficits always resolve between attacks, this is sometimes referred to as benign MS, although people will still accrue some degree of disability in the long term. On the other hand, the term malignant multiple sclerosis is used to describe MS patients who reach significant level of disability in a short period of time. The relapsing-remitting subtype usually begins with a clinically isolated syndrome (CIS). In CIS, a person has an attack suggestive of demyelination, but does not fulfill the criteria for multiple sclerosis. However only 30 to 70% of persons experiencing CIS later develop MS. Secondary progressive MS describes around 65% of those with an initial relapsing-remitting MS, who then begin to have progressive neurologic decline between acute attacks without any definite periods of remission. Occasional relapses and minor remissions may appear.The median time between disease onset and conversion from relapsing-remitting to secondary progressive MS is 19 years. The primary progressive subtype describes the approximately 10–15% of individuals who never have remission after their initial MS symptoms. It is characterized by progression of disability from onset, with no, or only occasional and minor, remissions and improvements. The age of onset for the primary progressive subtype is later than for the relapsing-remitting, but similar to mean age of progression between the relapsing-remitting and the secondary progressive. In both cases it is around 40 years of age. Disease-modifying treatments are expensive and most of these require frequent (up-to-daily) injections. Others require IV infusions (pictured) at 1–3 month intervals. As of April 2013, eight disease-modifying treatments have been approved by regulatory agencies of different countries. The approved drugs are interferon beta-1a, interferon beta-1b, glatiramer acetate, mitoxantrone, natalizumab, fingolimod, teriflunomide and dimethyl fumarate. The interferons and glatiramer acetate are delivered by frequent injections, varying from once-per-day for glatiramer acetate to once-per-week (but intra-muscular) for interferon beta-1a. Natalizumab and mitoxantrone are given by intravenous (IV) infusion at monthly intervals in the case of natalizumab and every three months in the case of mitoxantrone. In 2010 fingolimod became the first oral drug approved by the FDA, being followed by teriflunomide and dimethyl fumarate. Fingolimod and teriflunomide are taken through a daily single dose whereas dimethyl fumarate is administered twice daily. Most drugs are approved only for the relapsing-remitting course (RRMS). Medications are modestly effective at decreasing the number of attacks in RRMS. The earliest clinical presentation of RRMS is the clinically isolated syndrome (CIS). Treatment with interferons during an initial attack decreases the chance that a person will develop clinical MS. Treatment of progressive MS is more difficult than relapsing-remitting MS. Mitoxantrone has shown positive effects in those with secondary progressive and progressive relapsing courses. It is moderately effective in reducing the progression of the disease and the frequency of relapses in short-term follow-up. No treatment has been proven to modify the course of primary progressive MS.Efficacy of most common treatments, interferons and glatiramer acetate, in early-onset MS (before eighteen years of age) has been estimated to be roughly equivalent to adults. As with many medical treatments, these treatments have several adverse effects. One of the most common is irritation at the injection site for glatiramer acetate and the interferon treatments. Over time, a visible dent at the injection site, due to the local destruction of fat tissue, known as lipoatrophy, may develop. Interferons produce symptoms similar to influenza; some people taking glatiramer experience a post-injection reaction manifested by flushing, chest tightness, heart palpitations, breathlessness, and anxiety, which usually lasts less than thirty minutes. More dangerous but much less common are liver damage from interferons, severe cardiotoxicity, infertility, and acute myeloid leukemia of mitoxantrone, and the putative link between natalizumab and some cases of progressive multifocal leukoencephalopathy. Fingolimod may give rise to hypertension and bradycardia, macular edema, elevated liver enzymes or reduction in lymphocite levels. Teriflunomide is considered a very safe drug. Nevertheless there have been reports of liver failure and PML and it is dangerous for fetal development. Most common secondary effects of dimethyl fumarate are flushing and gastrointestinal problems. While dimethyl fumarate leads to a reduction in white blood cell count there were no reported cases of opportunistic infections during clinical trials. Disease-modifying treatments reduce the progression rate of the disease, but do not stop it. As multiple sclerosis progresses, the symptomatology tends to increase. The disease is associated with a variety of symptoms and functional deficits that result in a range of progressive impairments and disability. Management of these deficits is therefore very important. Both drug therapy and neurorehabilitation have shown to ease the burden of some symptoms, though neither influences disease progression. Some symptoms have a good response to medication, such as unstable bladder and spasticity, while management of many others is much more complicated. As for any person with neurologic deficits, amultidisciplinary approach is key to improving quality of life; however, there are particular difficulties in specifying a 'core team' because people with MS may need help from almost any health profession or service at some point. Multidisciplinary rehabilitation programs increase activity and participation of people with MS but do not influence impairment level. Due to the paucity of randomized controlled studies, there is limited evidence of the overall efficacy of individual therapy disciplines, though there is good evidence that specific approaches, such as exercise, psychology therapies, particularly cognitive behavioral approaches and energy conservation instruction are effective. Over 50% of MS patients may use complementary and alternative medicine, although numbers vary greatly depending on the definition of alternative medicine used. The evidence for effectiveness for such treatments in most cases is weak or absent. Examples of treatments used by patients with unproven efficacy are dietary supplementation and regimens,relaxation techniques such as yoga, herbal medicine (including the use of medical cannabis), hyperbaric oxygenation, self-infection with hookworm (known generally as helminthic therapy), reflexology or acupunture. Regarding the characteristics of users, they are more frequently women, have had MS for a longer time and tend to be more disabled. Moreover, they also have lower levels of satisfaction with conventional healthcare. There is a north-to-south gradient in the northern hemisphere and a south-to-north gradient in the southern hemisphere, with MS being much less common in people living near the equator.Climate, sunlight and intake of vitamin D have been investigated as possible causes of the disease that could explain this latitude gradient. However, there are important exceptions to the north–south pattern and changes in prevalence rates over time; in general, this trend might be disappearing. This indicates that other factors such as environment or genetics have to be taken into account to explain the origin of MS. MS is also more common in regions with northern European populations. But even in regions where MS is common, some ethnic groups are at low risk of developing the disease, including the Samis, Turkmen, Amerindians, Canadian Hutterites, Africans, and New Zealand Māori. The French neurologist Jean-Martin Charcot (1825–1893) was the first person to recognize multiple sclerosis as a distinct disease in 1868.Summarizing previous reports and adding his own clinical and pathological observations, Charcot called the disease sclerose en plaques. The three signs of MS now known as Charcot's triad 1 are nystagmus, intention tremor, and telegraphic speech (scanning speech), though these are not unique to MS. Charcot also observed cognition changes, describing his patients as having a "marked enfeeblement of the memory" and "conceptions that formed slowly". There have been important advances in the research of multiple sclerosis in the last decade that have led to a deeper comprenhension of the disease mechanisms and also to more effective treatments. Nevertheless, MS continues to be an active field of research. Magnetic resonance imaging brain scan produced using a Gradient-echo phase sequence. It shows an iron deposition in an existing white matter lesion (inside green box in the middle of the image; enhanced and signaled with red arrow at top-left hand side corner). This and other imaging techniques are still under development. Regarding diagnosis it is not expected that diagnostic criteria may change in the near future. On the other hand, while the search for biomarkers of the disease that may aid diagnosis, prediction of disease evolution,or evaluation of disease evolution, is intense there are not any expected breakthroughs in the short term. The variable clinical presentation of MS and the lack of diagnostic laboratory tests lead to delays in diagnosis and the impossibility of predicting diagnosis. New diagnostic methods that are being investigated include work with anti-myelin antibodies, and studies with serum and cerebrospinal fluidbut none of them has yielded reliable positive results. Currently there are no clinically established laboratory investigations available that can predict prognosis. However, several promising approaches have been proposed. Investigations on the prediction of evolution have centered on monitoring disease activity. Disease activation biomarkers includeinterleukin-6, nitric oxide and nitric oxide synthase, osteopontin, and fetuin-A. On the other hand since disease progression is the result of neurodegeneration the roles of proteins indicative of neuronal, axonal, and glial loss such as neurofilaments, tau and N-acetylaspartate are under investigation. A final investigative field is work with biomarkers that distinguish between medication responders and nonresponders. The improvement in neuroimaging techniques such as positron emission tomography (PET) or magnetic resonance imaging (MRI) carry a promise for better diagnosis and prognosis predictions, albeit the effect of such improvements in daily medical practice may take several decades. Regarding MRI, there are on the one hand several techniques that have already shown some usefulness in research settings and could be introduced into clinical practice, such as double-inversion recovery sequences, magnetization transfer, diffusion tensor, or functional magnetic resonance imaging. These techniques have a higher pathological specificity than existing ones, but still lack some development including standarization of acquisition protocols and the creation of normative values. On the other hand, there are also several techniques under development that could be useful. These include the use of new contrast agents capable of measuring levels of peripheral macrophages, inflammation, or neuronal dysfunction. Other techniques may quantify iron deposition and could serve to evaluate the role of this pathological feature in MS, or cerebral perfusion, which is known to be altered in patients. Similary new PET radiotracers might serve as markers of altered proccessess in MS such as brain inflammation, cortical pathology,apoptosis, or remylienation. The main measure of evolution of symptoms, specially important as an endpoint in MS trials, is the EDSS. However, this and other measures used in clinical studies are far from perfect and suffer from insetiveness or inadequate validation. In this sense there is ongoing research to improve the EDSS and other measures such as the Multiple Sclerosis Functional Composite. This is specially important at the current state of research where the greater efficacy of existing medications force functional measures in clinical trials to be highly sensitive in order to adequately measure disease changes. Progress in the field of genetics has been outstanding in the last two decades with highly improved methods and cheaper tests. These advances have in turn led to a greater understanding of the genetic component of MS. This trend is expected to continue, raising the possibility of discovering key mechanisms implicated in the disease. However, it is hard to predict how this future discoveries will impact in the clinical practice or in the research for new drugs and treatments. An example of a soon-to-be finished study is the Wellcome Trust case control consortium, a massive collaboration study including 120,000 genetic samples, of which 8000 are from individuals with MS. This study may presummibly identify all the common genetic variants involved in MS. Further studies will probably involve full genome sequencing of large samples, or the study of structural genetic variants such as insertions, deletions or polymorphisms. Advances during the last decades has led to the recent approval of several oral drugs. These drugs are expected to gain in popularity and frequency of use at the expense of previously existing therapies. Further oral drugs are still under investigation, the most notable example being laquinimod, which was announced in August 2012 to be the focus of a third phase III trial after mixed results in the previous ones. Similarly, Other studies are aimed to improve efficacy and ease of use of already existing therapies through the use of novel preparations. Such is the case the PEGylated version of interferon-β-1a, that has a longer life than normal interferon and therefore it is being studied if given at less frequent doses has a similar efficacy than the existing product. Request for approval of peginterferon beta-1a is expected during 2013. Monoclonal antibodies, which are drugs of the same family as natalizumab, have also raised high levels of interest and research. Alemtuzumab,daclizumab and CD20 monoclonal antibodies such as rituximab, ocrelizumab and ofatumumab have all shown some benefit and are under study as potential treatments for MS. Nevertheless their use has also been accompanied by the appearance of potentially dangerous adverse effects, most importantly opportunistic infections. Related to these investigations is the recent development of a test against JC virus antibodies which might help to predict what patients are at a greater risk of developing progressive multifocal leukoencephalopathy when taking natalizumab. While monoclonal antibodies are probably going to have some role in the treatment of the disease in the future, it is believed that it will be small due to the risks associated to them. In 2008, vascular surgeon Paolo Zamboni suggested that MS involves a vascular process he referred to as chronic cerebrospinal venous insufficiency (CCSVI), in which veins from the brain are constricted. He found CCSVI in all patients with MS in his study, performed a surgical procedure, later called in the media "liberation procedure" to correct it and claimed that 73% of participants improved. This theory received important attention in the media and among MS patients, specially in Canada. Concern has been raised with Zamboni's research as it was neither blinded nor controlled, and additionally its assumptions about the pathophisiology of the disease may not be backed by known data. Also further studies have either not found a relationship or found a much less strong one. This has raised serious objections to the hypothesis of CCSVI originating MS. The "liberation procedure" has been criticized for possibly resulting in serious complications and deaths while its benefits have not been proven. Currently it is recommended not to use the proposed treatment unless its effectiveness is confirmed by controlled studies. Research on CCSVI has been fast tracked but researchers have been unable to confirm whether CCSVI has a role in causing MS.
^ a b c d e f g h i j k l m n o p q r s t u v w x y z aa ab ac ad ae af agah ai aj ak al am an ao ap aq ar as at au av aw ax ay az ba bb bcbd be bf bg Compston, A; Coles, A (2008 Oct 25). "Multiple sclerosis.". Lancet 372 (9648): 1502–17. PMID 18970977. * Charcot, J. (1868). "Histologie de la sclerose en plaques".Gazette des hopitaux, Paris 41: 554–5. ^ a b c d e f g h i j k l m n o p q Compston A, Coles A (April 2002). "Multiple sclerosis". Lancet 359 (9313): 1221–31.doi:10.1016/S0140-6736(02)08220-X. PMID 11955556. ^ a b c d e f g h Ascherio A, Munger KL (April 2007). "Environmental risk factors for multiple sclerosis. Part I: the role of infection". Ann. Neurol. 61 (4): 288–99.doi:10.1002/ana.21117. PMID 17444504. ^ Mazziotta, John C.; Robert I. Simon MD; Gerald Miletello MD; MD, Joseph Capella (2012). "Depression and Psychosis in Neurological Practice.". Bradley's Neurology in Clinical Practice: Expert Consult - Online and Print, 6e (Bradley, Neurology in Clinical Practice e-dition 2v Set). Philadelphia: Saunders. ISBN 1-4377-0434-4. ^ a b c d e f g h Lublin FD, Reingold SC (April 1996). "Defining the clinical course of multiple sclerosis: results of an international survey. National Multiple Sclerosis Society (USA) Advisory Committee on Clinical Trials of New Agents in Multiple Sclerosis". Neurology 46 (4): 907–11.doi:10.1212/WNL.46.4.907. PMID 8780061. ^ a b c Weinshenker BG (1994). "Natural history of multiple sclerosis". Ann. Neurol. 36 (Suppl): S6–11.doi:10.1002/ana.410360704. PMID 8017890. ^ Davis FA, Bergen D, Schauf C, McDonald I, Deutsch W (November 1976). "Movement phosphenes in optic neuritis: a new clinical sign". Neurology 26 (11): 1100–4.doi:10.1212/WNL.26.11.1100. PMID 988518. ^ Page NG, Bolger JP, Sanders MD (January 1982). "Auditory evoked phosphenes in optic nerve disease". J. Neurol. Neurosurg. Psychiatr. 45 (1): 7–12.doi:10.1136/jnnp.45.1.7. PMC 491258.PMID 7062073. ^ Kurtzke JF (1983). "Rating neurologic impairment in multiple sclerosis: an expanded disability status scale (EDSS)". Neurology 33 (11): 1444–52.doi:10.1212/WNL.33.11.1444. PMID 6685237. ^ a b Tataru N, Vidal C, Decavel P, Berger E, Rumbach L (2006). "Limited impact of the summer heat wave in France (2003) on hospital admissions and relapses for multiple sclerosis". Neuroepidemiology 27 (1): 28–32.doi:10.1159/000094233. PMID 16804331. ^ Heesen C, Mohr DC, Huitinga I, et al. (March 2007). "Stress regulation in multiple sclerosis: current issues and concepts". Mult. Scler. 13 (2): 143–8.doi:10.1177/1352458506070772. PMID 17439878. ^ Martinelli V (2000). "Trauma, stress and multiple sclerosis". Neurol. Sci. 21 (4 Suppl 2): S849–52.doi:10.1007/s100720070024. PMID 11205361. ^ Minagar A, Jy W, Jimenez JJ, Alexander JS. (April 2006). "Multiple sclerosis as a vascular disease". Neurol Res.28 (3): 230–5. doi:10.1179/016164106X98080.PMID 16687046. ^ Dyment DA, Ebers GC, Sadovnick AD (February 2004). "Genetics of multiple sclerosis". Lancet Neurol 3 (92): 104–10. doi:10.1016/S1474-4422(03)00663-X.PMID 14747002. ^ a b c d e f g Baranzini SE (June 2011). "Revealing the genetic basis of multiple sclerosis: are we there yet?".Curr. Opin. Genet. Dev. 21 (3): 317–24.doi:10.1016/j.gde.2010.12.006. PMC 3105160.PMID 21247752. ^ a b c d e f g h Marrie RA (December 2004). "Environmental risk factors in multiple sclerosis aetiology". 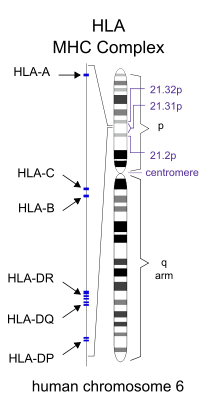 Lancet Neurol 3(12): 709–18. doi:10.1016/S1474-4422(04)00933-0.PMID 15556803. ^ a b c d e Ascherio A, Munger KL (June 2007). "Environmental risk factors for multiple sclerosis. Part II: Noninfectious factors". Ann. Neurol. 61 (6): 504–13.doi:10.1002/ana.21141. PMID 17492755. ^ Ascherio A, Munger KL, Simon KC (June 2010). "Vitamin D and multiple sclerosis". Lancet Neurol 9 (6): 599–612.doi:10.1016/S1474-4422(10)70086-7. PMID 20494325. ^ Spitsin S, Koprowski H (2008). "Role of uric acid in multiple sclerosis". Curr. Top. Microbiol. Immunol. Current Topics in Microbiology and Immunology 318: 325–42.doi:10.1007/978-3-540-73677-6_13. ISBN 978-3-540-73676-9. PMID 18219824. ^ a b c Kurtzke JF (October 1993). "Epidemiologic evidence for multiple sclerosis as an infection". Clin. Microbiol. Rev. 6 (4): 382–427. doi:10.1128/CMR.6.4.382.PMC 358295. PMID 8269393. ^ Gilden DH (March 2005). "Infectious causes of multiple sclerosis". The Lancet Neurology 4 (3): 195–202.doi:10.1016/S1474-4422(05)01017-3. PMID 15721830. ^ Ho,PP et al. ; Kanter, J. L.; Johnson, A. M.; Srinagesh, H. K.; Chang, E.-J. ; Purdy, T. M.; Van Haren, K.; Wikoff, W. R. et al. (2012). "Identification of naturally occurring fatty acids of the myelin sheath that resolve neuroinflammation". Science Translational Medicine 4 (137): 137–73.doi:10.1126/scitranslmed.3003831. PMID 22674551. ^ Wucherpfennig, K.; Strominger, J. (1995). "Molecular mimicry in T cell-mediated autoimmunity: Viral peptides activate human T cell clones specific for myelin basic protein". Cell 80 (5): 695–705. doi:10.1016/0092-8674(95)90348-8. PMID 7534214. ^ a b Chari DM (2007). "Remyelination in multiple sclerosis".Int. Rev. Neurobiol. International Review of Neurobiology 79: 589–620. doi:10.1016/S0074-7742(07)79026-8.ISBN 978-0-12-373736-6. PMID 17531860. ^ Pittock SJ, Lucchinetti CF (March 2007). "The pathology of MS: new insights and potential clinical applications".Neurologist 13 (2): 45–56.doi:10.1097/01.nrl.0000253065.31662.37.PMID 17351524. ^ Trojano M, Paolicelli D (November 2001). "The differential diagnosis of multiple sclerosis: classification and clinical features of relapsing and progressive neurological syndromes". Neurol. Sci. 22 (Suppl 2): S98–102.doi:10.1007/s100720100044. PMID 11794488. ^ Poser CM, Brinar VV (June 2004). "Diagnostic criteria for multiple sclerosis: an historical review". Clin Neurol Neurosurg 106 (3): 147–58.doi:10.1016/j.clineuro.2004.02.004. PMID 15177763. ^ a b c d McDonald WI, Compston A, Edan G, et al. (July 2001). "Recommended diagnostic criteria for multiple sclerosis: guidelines from the International Panel on the diagnosis of multiple sclerosis". Ann. Neurol. 50 (1): 121–7.doi:10.1002/ana.1032. PMID 11456302. ^ Link H, Huang YM (November 2006). "Oligoclonal bands in multiple sclerosis cerebrospinal fluid: an update on methodology and clinical usefulness". J. Neuroimmunol.180 (1–2): 17–28. doi:10.1016/j.jneuroim.2006.07.006.PMID 16945427. ^ Gronseth GS, Ashman EJ (May 2000). "Practice parameter: the usefulness of evoked potentials in identifying clinically silent lesions in patients with suspected multiple sclerosis (an evidence-based review): Report of the Quality Standards Subcommittee of the American Academy of Neurology". Neurology 54 (9): 1720–5.doi:10.1212/WNL.54.9.1720. PMID 10802774. ^ Pittock SJ, Rodriguez M (2008). "Benign multiple sclerosis: a distinct clinical entity with therapeutic implications". Curr. Top. Microbiol. Immunol. Current Topics in Microbiology and Immunology 318: 1–17. doi:10.1007/978-3-540-73677-6_1. ISBN 978-3-540-73676-9. PMID 18219812. ^ Feinstein, Anthony (2007). The clinical neuropsychiatry of multiple sclerosis (2nd ed. ed.). Cambridge: Cambridge University Press. p. 20. ISBN 052185234X. ^ a b Miller D, Barkhof F, Montalban X, Thompson A, Filippi M (May 2005). "Clinically isolated syndromes suggestive of multiple sclerosis, part I: natural history, pathogenesis, diagnosis, and prognosis". Lancet Neurol 4 (5): 281–8.doi:10.1016/S1474-4422(05)70071-5. PMID 15847841. ^ a b c Miller DH, Leary SM (October 2007). "Primary-progressive multiple sclerosis". Lancet Neurol 6 (10): 903–12. doi:10.1016/S1474-4422(07)70243-0.PMID 17884680. ^ Stadelmann C, Brück W (November 2004). "Lessons from the neuropathology of atypical forms of multiple sclerosis".Neurol. Sci. 25 (Suppl 4): S319–22. doi:10.1007/s10072-004-0333-1. PMID 15727225. ^ Burton, JM (2012 Dec 12). "Oral versus intravenous steroids for treatment of relapses in multiple sclerosis. ".Cochrane Database of Systematic Reviews (12):CD006921 (Orig. rev.).doi:10.1002/14651858.CD006921. PMID 23235634. ^ Multiple sclerosis : national clinical guideline for diagnosis and management in primary and secondary care (pdf). London: Royal College of Physicians. 2004. pp. 54–57.ISBN 1-86016-182-0. PMID 21290636. Retrieved 6 February 2013. ^ a b "FDA approves first oral drug to reduce MS relapses"(Press release). US FDA. 2010-09-22. Retrieved 2013-01-21. ^ a b c d e "Biogen Idec’s TECFIDERA™ (Dimethyl Fumarate) Approved in US as a First-Line Oral Treatment for Multiple Sclerosis". Biogen Idec Press Release. 2013-03-27. ^ "NDA 204063 - FDA Approved Labeling Text". US Food and Drug Agency. 27 March 2013. Retrieved 5 April 2013. "NDA Approval". US Food and Drug Agency. 27 March 2013. Retrieved 5 April 2013. ^ Marriott, J. J.; Miyasaki, J. M.; Gronseth, G.; O'Connor, P. W. (3 May 2010). "Evidence Report: The efficacy and safety of mitoxantrone (Novantrone) in the treatment of multiple sclerosis: Report of the Therapeutics and Technology Assessment Subcommittee of the American Academy of Neurology". Neurology 74 (18): 1463–1470.doi:10.1212/WNL.0b013e3181dc1ae0. PMC 2871006.PMID 20439849. ^ Kappos, L; Bates, D; Edan, G; Eraksoy, M; Garcia-Merino, A; Grigoriadis, N; Hartung, HP; Havrdová, E; Hillert, J; Hohlfeld, R; Kremenchutzky, M; Lyon-Caen, O; Miller, A; Pozzilli, C; Ravnborg, M; Saida, T; Sindic, C; Vass, K; Clifford, DB; Hauser, S; Major, EO; O'Connor, PW; Weiner, HL; Clanet, M; Gold, R; Hirsch, HH; Radü, EW; Sørensen, PS; King, J (2011 Aug). "Natalizumab treatment for multiple sclerosis: updated recommendations for patient selection and monitoring". Lancet neurology 10 (8): 745–58.doi:10.1016/S1474-4422(11)70149-1. PMID 21777829. ^ Gylenya medication guide (pdf). Novartis Pharmaceuticals Corporation. May 2012. p. 2. Retrieved 2013-01-21. ^ He, D; Xu, Z; Dong, S; Zhang, H; Zhou, H; Wang, L; Zhang, S (2012 Dec 12). "Teriflunomide for multiple sclerosis". In Zhou, Hongyu. Cochrane database of systematic reviews (Online) 12: CD009882.doi:10.1002/14651858.CD009882.pub2.PMID 23235682. ^ Johnson KP (2007). "Control of multiple sclerosis relapses with immunomodulating agents". J. Neurol. Sci.256 (Suppl 1): S23–8. doi:10.1016/j.jns.2007.01.060.PMID 17350652. ^ a b c Comi G (October 2009). "Treatment of multiple sclerosis: role of natalizumab". Neurol. Sci. 30. Suppl 2 (S2): S155–8. doi:10.1007/s10072-009-0147-2.PMID 19882365. ^ a b Freedman, M. S. (27 December 2010). "Long-term follow-up of clinical trials of multiple sclerosis therapies".Neurology 76 (1, Supplement 1): S26–S34.doi:10.1212/WNL.0b013e318205051d.PMID 21205679. ^ Qizilbash, N; Mendez, I; Sanchez-de la Rosa, R (2012 Jan). "Benefit-risk analysis of glatiramer acetate for relapsing-remitting and clinically isolated syndrome multiple sclerosis". Clinical therapeutics 34 (1): 159–176.e5.doi:10.1016/j.clinthera.2011.12.006. PMID 22284996. ^ Bates, D (2011 Jan 4). "Treatment effects of immunomodulatory therapies at different stages of multiple sclerosis in short-term trials". Neurology 76 (1 Suppl 1): S14–25. doi:10.1212/WNL.0b013e3182050388.PMID 21205678. ^ Martinelli Boneschi F, Rovaris M, Capra R, Comi G (2005). "Mitoxantrone for multiple sclerosis". In Martinelli Boneschi, Filippo. Cochrane database of systematic reviews (Online)(4): CD002127. doi:10.1002/14651858.CD002127.pub2.PMID 16235298. ^ Leary SM, Thompson AJ (2005). "Primary progressive multiple sclerosis: current and future treatment options".CNS Drugs 19 (5): 369–76. doi:10.2165/00023210-200519050-00001. PMID 15907149. ^ Johnston, J; So, TY (2012 Jun 18). "First-line disease-modifying therapies in paediatric multiple sclerosis: a comprehensive overview". Drugs 72 (9): 1195–211.doi:10.2165/11634010-000000000-00000.PMID 22642799. ^ Munari L, Lovati R, Boiko A (2004). "Therapy with glatiramer acetate for multiple sclerosis". In Munari, Luca M.Cochrane database of systematic reviews (Online) (1): CD004678. doi:10.1002/14651858.CD004678.PMID 14974077. ^ Tremlett H, Oger J (November 2004). "Hepatic injury, liver monitoring and the beta-interferons for multiple sclerosis".J. Neurol. 251 (11): 1297–303. doi:10.1007/s00415-004-0619-5. PMID 15592724. ^ a b Killestein, Joep; Rudick, Richard A; Polman, Chris H (1 November 2011). "Oral treatment for multiple sclerosis". The Lancet Neurology 10 (11): 1026–1034. doi:10.1016/S1474-4422(11)70228-9. PMID 22014437. ^ Khan F, Turner-Stokes L, Ng L, Kilpatrick T (2007). "Multidisciplinary rehabilitation for adults with multiple sclerosis". In Khan, Fary. Cochrane Database Syst Rev (2): CD006036. doi:10.1002/14651858.CD006036.pub2.PMID 17443610. ^ a b Steultjens EM, Dekker J, Bouter LM, Leemrijse CJ, van den Ende CH (2005). "Evidence of the efficacy of occupational therapy in different conditions: an overview of systematic reviews". Clinical rehabilitation 19 (3): 247–54.doi:10.1191/0269215505cr870oa. PMID 15859525. ^ Steultjens EM, Dekker J, Bouter LM, Cardol M, Van de Nes JC, Van den Ende CH (2003). "Occupational therapy for multiple sclerosis". In Steultjens, Esther EMJ. Cochrane database of systematic reviews (Online) (3): CD003608.doi:10.1002/14651858.CD003608. PMID 12917976. ^ Gallien P, Nicolas B, Robineau S, Pétrilli S, Houedakor J, Durufle A (2007). "Physical training and multiple sclerosis".Ann Readapt Med Phys 50 (6): 373–6, 369–72.doi:10.1016/j.annrmp.2007.04.004. PMID 17482708. ^ Rietberg MB, Brooks D, Uitdehaag BMJ, Kwakkel G (2005). "Exercise therapy for multiple sclerosis". In Kwakkel, Gert.Cochrane Database of Systematic Reviews (1): CD003980.doi:10.1002/14651858.CD003980.pub2.PMID 15674920. ^ Thomas PW, Thomas S, Hillier C, Galvin K, Baker R (2006). "Psychological interventions for multiple sclerosis". In Thomas, Peter W. Cochrane Database of Systematic Reviews (1): CD004431.doi:10.1002/14651858.CD004431.pub2.PMID 16437487. ^ Mathiowetz V, Matuska KM, Murphy ME (2001). "Efficacy of an energy conservation course for persons with multiple sclerosis". Arch Phys Med Rehabil 82 (4): 449–56.doi:10.1053/apmr.2001.22192. PMID 11295003. ^ a b c d e f g Huntley A (January 2006). "A review of the evidence for efficacy of complementary and alternative medicines in MS". Int MS J 13 (1): 5–12, 4.PMID 16420779. ^ Olsen SA (2009). "A review of complementary and alternative medicine (CAM) by people with multiple sclerosis". Occup Ther Int 16 (1): 57–70.doi:10.1002/oti.266. PMID 19222053. ^ Farinotti M, Simi S, Di Pietrantonj C, et al. (2007). "Dietary interventions for multiple sclerosis". In Farinotti, Mariangela.Cochrane database of systematic reviews (Online) (1): CD004192. doi:10.1002/14651858.CD004192.pub2.PMID 17253500. ^ Chong MS, Wolff K, Wise K, Tanton C, Winstock A, Silber E (2006). "Cannabis use in patients with multiple sclerosis".Mult. Scler. 12 (5): 646–51.doi:10.1177/1352458506070947. PMID 17086912. ^ Bennett M, Heard R (2004). "Hyperbaric oxygen therapy for multiple sclerosis". In Bennett, Michael H. Cochrane database of systematic reviews (Online) (1): CD003057.doi:10.1002/14651858.CD003057.pub2.PMID 14974004. ^ a b c Phadke JG (May 1987). "Survival pattern and cause of death in patients with multiple sclerosis: results from an epidemiological survey in north east Scotland". J. Neurol. Neurosurg. Psychiatr. 50 (5): 523–31.doi:10.1136/jnnp.50.5.523. PMC 1031962.PMID 3495637. ^ Myhr KM, Riise T, Vedeler C, et al (February 2001). "Disability and prognosis in multiple sclerosis: demographic and clinical variables important for the ability to walk and awarding of disability pension". Mult. Scler. 7(1): 59–65. PMID 11321195. ^ a b c Alonso A, Hernán MA (July 2008). "Temporal trends in the incidence of multiple sclerosis: a systematic review".Neurology 71 (2): 129–35.doi:10.1212/01.wnl.0000316802.35974.34.PMID 18606967. ^ Kulie T, Groff A, Redmer J, Hounshell J, Schrager S (2009). "Vitamin D: an evidence-based review". J Am Board Fam Med 22 (6): 698–706.doi:10.3122/jabfm.2009.06.090037. PMID 19897699. ^ a b Compston A (October 1988). "The 150th anniversary of the first depiction of the lesions of multiple sclerosis". J. Neurol. Neurosurg. Psychiatr. 51 (10): 1249–52.doi:10.1136/jnnp.51.10.1249. PMC 1032909.PMID 3066846. ^ Lassmann H (1999-10-29). "The pathology of multiple sclerosis and its evolution". Philos Trans R Soc Lond B Biol Sci. 354 (1390): 1635–40.doi:10.1098/rstb.1999.0508. PMC 1692680.PMID 10603616. ^ Lassmann H (July 2005). "Multiple sclerosis pathology: evolution of pathogenetic concepts". Brain Pathology 15 (3): 217–22. doi:10.1111/j.1750-3639.2005.tb00523.x.PMID 16196388. ^ Holmøy T (2006). "A Norse contribution to the history of neurological diseases". Eur. Neurol. 55 (1): 57–8.doi:10.1159/000091431. PMID 16479124. ^ a b Pearce JM (2005). 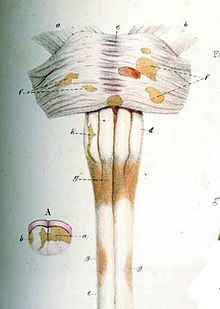 "Historical descriptions of multiple sclerosis". Eur. Neurol. 54 (1): 49–53.doi:10.1159/000087387. PMID 16103678. ^ a b c d e f g h i j Miller AE (2011). "Multiple sclerosis: where will we be in 2020?". Mt. Sinai J. Med. 78 (2): 268–79.doi:10.1002/msj.20242. PMID 21425270. ^ Mehta V, Pei W, Yang G, et al. (2013). "Iron is a sensitive biomarker for inflammation in multiple sclerosis lesions".PLoS ONE 8 (3): e57573.doi:10.1371/journal.pone.0057573. PMC 3597727.PMID 23516409. ^ a b c d Harris VK, Sadiq SA (2009). "Disease biomarkers in multiple sclerosis: potential for use in therapeutic decision making". Mol Diagn Ther 13 (4): 225–44.doi:10.2165/11313470-000000000-00000.PMID 19712003. ^ a b c d e Filippi M, Rocca MA, De Stefano N, et al. (December 2011). "Magnetic resonance techniques in multiple sclerosis: the present and the future". Arch. Neurol.68 (12): 1514–20. doi:10.1001/archneurol.2011.914.PMID 22159052. ^ Kiferle L, Politis M, Muraro PA, Piccini P (February 2011). "Positron emission tomography imaging in multiple sclerosis-current status and future applications". Eur. J. Neurol. 18 (2): 226–31. doi:10.1111/j.1468-1331.2010.03154.x. PMID 20636368. ^ a b Cohen JA, Reingold SC, Polman CH, Wolinsky JS (May 2012). "Disability outcome measures in multiple sclerosis clinical trials: current status and future prospects". Lancet Neurol 11 (5): 467–76. doi:10.1016/S1474-4422(12)70059-5. PMID 22516081. ^ Cohen JA (July 2009). "Emerging therapies for relapsing multiple sclerosis". Arch. Neurol. 66 (7): 821–8.doi:10.1001/archneurol.2009.104. PMID 19597083. ^ Jeffrey, susan (09 Aug 2012). "CONCERTO: A Third Phase 3 Trial for Laquinimod in MS". Medscape Medical News. Retrieved 21 May 2013. ^ Kieseier BC, Calabresi PA (March 2012). "PEGylation of interferon-β-1a: a promising strategy in multiple sclerosis".CNS Drugs 26 (3): 205–14. doi:10.2165/11596970-000000000-00000. PMID 22201341. ^ a b Biogen Idec (24 Jan 2013). "Biogen Idec Announces Positive Top-Line Results from Phase 3 Study of Peginterferon Beta-1a in Multiple Sclerosis-Press release". Retrieved 21 May 2013. ^ Saidha S, Eckstein C, Calabresi PA (January 2012). "New and emerging disease modifying therapies for multiple sclerosis". Ann. N. Y. Acad. Sci. 1247: 117–37.doi:10.1111/j.1749-6632.2011.06272.x.PMID 22224673. ^ a b c d Milo R, Panitch H (February 2011). "Combination therapy in multiple sclerosis". J. Neuroimmunol. 231 (1-2): 23–31. doi:10.1016/j.jneuroim.2010.10.021.PMID 21111490. ^ Luessi F, Siffrin V, Zipp F (September 2012). "Neurodegeneration in multiple sclerosis: novel treatment strategies". Expert Rev Neurother 12 (9): 1061–76; quiz 1077. doi:10.1586/ern.12.59. PMID 23039386. ^ Zamboni P, Galeotti R, Menegatti E, et al. (April 2009). "Chronic cerebrospinal venous insufficiency in patients with multiple sclerosis". J. Neurol. Neurosurg. Psychiatr. 80(4): 392–9. doi:10.1136/jnnp.2008.157164.PMC 2647682. PMID 19060024. ^ Pullman D, Zarzeczny A, Picard A (2013). "Media, politics and science policy: MS and evidence from the CCSVI Trenches". BMC Med Ethics 14: 6. doi:10.1186/1472-6939-14-6. PMC 3575396. PMID 23402260. ^ a b Qiu J (May 2010). "Venous abnormalities and multiple sclerosis: another breakthrough claim?". Lancet Neurol 9(5): 464–5. doi:10.1016/S1474-4422(10)70098-3.PMID 20398855. ^ a b Ghezzi A, Comi G, Federico A (February 2011). "Chronic cerebro-spinal venous insufficiency (CCSVI) and multiple sclerosis". Neurol. Sci. 32 (1): 17–21. doi:10.1007/s10072-010-0458-3. PMID 21161309. ^ Dorne H, Zaidat OO, Fiorella D, Hirsch J, Prestigiacomo C, Albuquerque F, Tarr RW. (October 2010). "Chronic cerebrospinal venous insufficiency and the doubtful promise of an endovascular treatment for multiple sclerosis". J NeuroIntervent Surg 2 (4): 309–311.doi:10.1136/jnis.2010.003947. PMID 21990639. ^ Khan O, Filippi M, Freedman MS, Barkhof F, Dore-Duffy P, Lassmann H, Trapp B, Bar-Or A, Zak I, Siegel MJ, Lisak R (2010-02-12). "Chronic cerebrospinal venous insufficiency and multiple sclerosis". Annals of neurology (Annals of Neurology) 67 (3): 286–90. doi:10.1002/ana.22001.PMID 20373339.